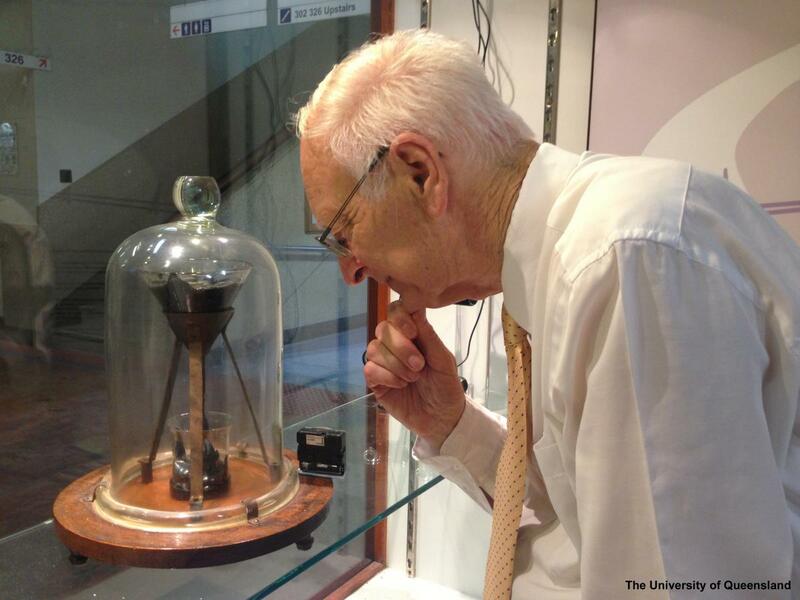 The Pitch Drop experiment is designed to demonstrate that pitch is a high viscosity fluid and not a solid. It began in 1927, when Professor Thomas Parnell heated a sample of pitch and poured it into a glass funnel with a sealed stem. When the pitch was heated the viscosity was much lower and so it was clear that the pitch was a liquid. Three years were allowed for the pitch to settle, and in 1930 the sealed stem was cut. The now cooled pitch appeared to be a solid, it was hard to the touch and would shatter if hit by a hammer. However, from that date on the pitch has slowly dripped out of the funnel - so slowly that now, nearly 90 years later, the ninth drop has only just fallen. This shows that pitch is in fact a very slow moving fluid. The ninth drop touched the eighth drop (and so was considered to have fallen), on the 24th of April 2014. The experiment was set up as a demonstration and is not kept under special environmental conditions, so the rate of flow of the pitch varies with seasonal changes in temperature. In the mid 1990s the University also began to air condition the nearby lecture theatres, cooling and thus slowing the eighth drop. Nonetheless, it is possible to make an estimate of the viscosity of this sample of pitch. It turns out to be about 100 billion times more viscous than water! The original beaker became too full for the drops to fall freely and so was removed after the ninth drop. It is now sitting to the left of the experiment and a fresh beaker has been placed underneath the tenth drop. The Pitch Drop Experiment is famous, mentioned by several Brisbane authors and listed by the Guinness Book of Records in 2002 as the "world's longest-running laboratory experiment". Thomas Parnell and the late Prof John Mainstone were awarded the 2005 Ig Nobel Prize in Physics for starting and maintaining the experiment. It is continuously streamed live on the internet for fans wanting to follow its progress.